Posted September 2, 2015 by Jackie McMillan & filed under Chinese, Eat & Drink, Indian, Pan Asian. 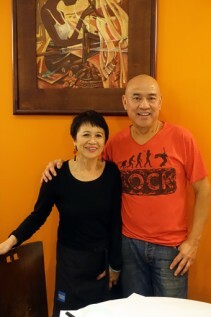 At the end of this week, Balmain loses an icon: owner/chef Andrew Lum, and with him, his popular restaurant Satasia. This iconic restaurant has been a Balmain stalwart for the last thirty-three and a half years. Speaking to this engaging chef between rammed Friday lunch and dinner sittings, as takeaway orders ring off the hook, I asked him why he’s closing a restaurant at the height of its success? “I’d like a dollar for everyone who’s just called me selfish,” jokes Lum, who’s actually been cooking on the peninsula for the last forty-five years. He’s quick to add his real reason to quit while he’s ahead: “Satasia is so successful, I have to retire. I’d work myself sick. I have to get out.” It’s hard to believe the energetic man before me turns 70 next year! Satasia is one of the most successful pan-Asian fusion restaurants I’ve encountered. Lum puts his mastery of multiple cuisines down to his Fijian upbringing: “I grew up with multiculturalism – Asian parents and a multicultural school.” His dishes are derived from Indian and Chinese roots, and he keeps his palate honed with regular travel “back to the villages”, including a “four month stint in the Himalayas”. Lum is full of praise for his family of staff, and customers, many of whom he says, have become long-term friends. He’s retiring to Fiji for a well-earned rest.